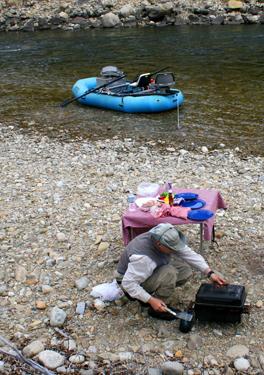 Float and Wade Trips Include: transportation, gourmet lunch, non-alcoholic beverages, flies tippet, floatant and other accessories. Half day trips include beverages and a light lunch. We request a $150 deposit per boat upon booking. Deposits are refundable up to within 14 days of trip date. Licenses and gratuities are not included in any of the trip rates. Guiding services conducted outside of the Bitterroot Valley are subject to a $40 travel fee additional to the daily rate. Our float trips are made in custom fishing rafts or drift boats depending on the river conditions. All of our guide staff are seasoned oarsmen as well as anglers.